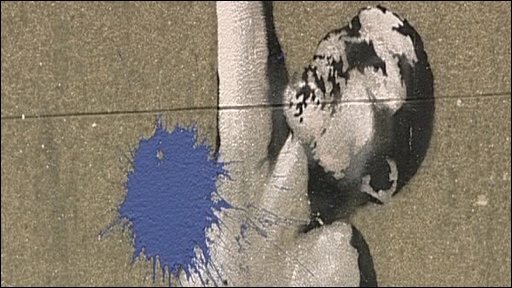 A picture painted in a Bristol street by the artist Banksy has been vandalised with blue paint. The image on the side of a building on Park Street in Bristol shows a naked man hanging out of a window. The city council ran a public vote in 2006 asking people whether the mural should stay or be removed - 93% of people voted that it should remain. Bristol Museum is currently showing an exhibition of his work which runs for 12 weeks from 13 June. Councillor Gary Hopkins, of Bristol City Council, said: "I'm disappointed but unfortunately not surprised. "People are built up and then there are always some people who want to drag them back down again. "I think the turning point in his reputation was when we decided to keep this piece of work but maybe that destroyed his street cred."